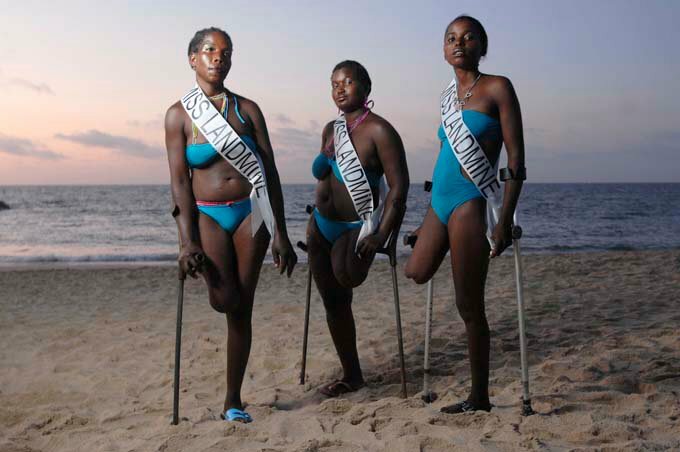 In 2008 a Norwegian film maker, Morten Traavik, organised a beauty pageant in Angola that featured women who had lost limbs because of landmines. Although the idea seems a bit shocking, it was a concept developed to challenge the conventional concepts of beauty, and the general image of Africans as victims. Disabled women in developing countries have little hope of starting a family or supporting themselves. So because they were being given a voice for the very first time, the contestants saw it as a potentially life changing event. Teh contest aimed to promote pride and beauty despite imperfections, while at the same time raising awareness of landmine victims and their reintegration into society. The objectifying of women in this case becomes, as Traavik calls it, subjectifying them. After the contest in Angola proved a success, Traavik set his sights on Cambodia, another heavily landmined country, to replicate the event there. Together with photographer Gorm Gaare, he produced a documentary about the process of organising the Miss Landmine Cambodia contest: finding the candidates, then interviewing and photographing them. I was impressed by how brave the girls were about posing for photos in pretty western dresses. Posing for photos is not something that Cambodian girls would generally do without layers of makeup and jewellery. After years of being stigmatised, these women were finally the stars of the show. As controversial as the photographs are, it is still baffling how the initially supportive government made a 180 turnaround and forbade the show from going ahead. In the end, Morten was told to leave the country and forbidden to return. They said the contest was demeaning to the women, something that obviously was not the case when the women were asked their view. “Disabled people are depressed about their injuries so the government should have allowed it to continue. This is not the same as an able-bodied contest. We want to show everyone that we are people too and have our own abilities.” one of the contestants says. 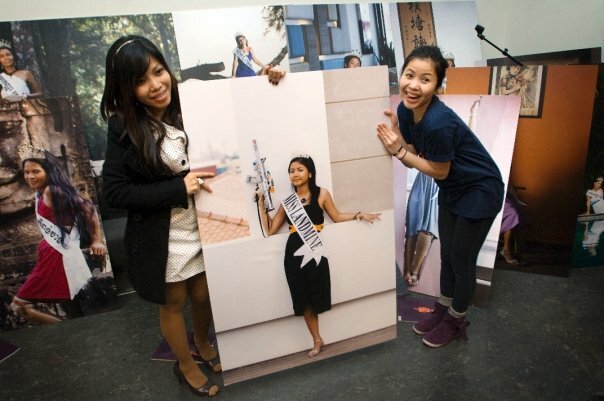 Not one to quit easily, Traavik continued with the project and held the pageant in a Cambodian immigrant community in Norway, using the enlarged photos of the twenty contestants. An online vote was held and a winner, 16 year old Dos Sopheap, announced. She won a titanium prosthetic leg and US$1000 to follow her dream to become an accountant. Traavik returned to Cambodia undercover to deliver the prosthetic leg personally and conclude the project with a visit to all the contestants with consolation cash prizes. “Since my pictures have been shown around the world I am very happy. Before, no one wanted to hang out with me. Since I won I have many more friends.” Sopheap said. She now looks forward to being able to support her family. Now that is what I call art. 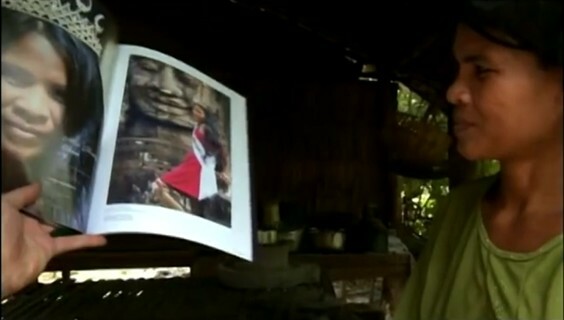 To date, the documentary has been screened in various countries, including Cambodia in 2013. Watch it here. 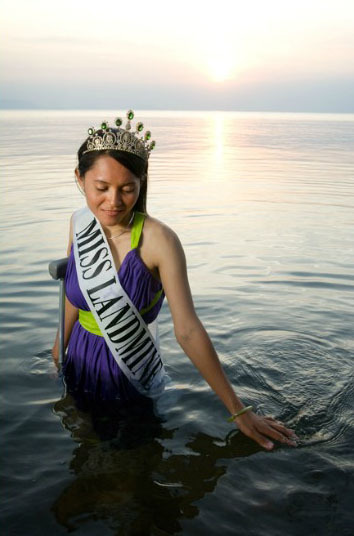 Photos from www.miss-landmine.org and stills from documentary “Miss Landmine 2010” by Morten Traavik.